At Answer Fort Smith, our leadership is devoted to finding next level innovations to support your business' growth. We strive to deliver an unmatched customer service experience and to build revenue for you. Answer Fort Smith, Inc. was established in 1981 by Hugh Jones, or as his family and friends like to call him, Hoot. Once a small answering service in a building beside his home, AFS has grown greatly over the years. We are now a nationwide call center and reside in a 35,000 sq. foot facility located in Fort Smith, AR. As we continue to evolve as a company we look at our resources and leverage those resources to maximize our effectiveness. Today we announce some very positive changes to move us closer to our operational and organizational goals. These changes are effective immediately but these resources will be working at a reduced capacity to assist with transition. Jacie Meier - will be moving to Business Development and Marketing. Her role will fully transition January 1st, Jacie will continue to assist as needed during the transition. Kelli Gann – will be moving from Operations Manager to her new role as Client Relations Manager. She will be working with Jacie to learn the day to day role as well as billing and other duties. Melanie Lange – will be moving to the role as Interim Operations Manager. Mel will be working with Kelli as she makes the transition to take on all the duties of Operations Manager. Please congratulate Jacie, Kelli, and Mel as they step up and take on the challenges of these new roles. We are very excited to see all the value they will bring as we continue to evolve as a company! Our team consists of highly qualified, experienced and knowledgeable industry professionals that are passionate and dedicated to our clients. DO YOU ONLY TAKE OUR CALLS AFTER HOURS AND ON WEEKENDS? Our highly trained staff members are available to take your calls 24 hours a day, 7 days a week, 365 days a year. We can take your calls after hours or we can assist your office staff by taking overflow calls during the day. CAN YOU TAKE ORDERS FOR OUR PRODUCTS FROM CALLERS AND RUN THEIR CREDIT CARDS OR E-CHECKS? Yes! We are fully capable of taking and processing your orders. 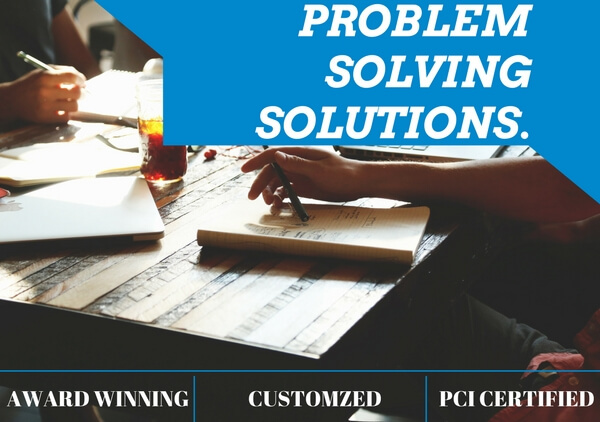 We are a PCI certified and compliant business solutions center. Every business is different, with varying service requirements and volume levels. Because of this, we customize each account according to the client’s specific needs. Please call us for a quote that is tailored specifically for your business.